This textbook introduces students to the social teachings of the Catholic Church, a rich body of thought covering love and family, law and justice, war and peace, wealth and poverty, rights and duties, and freedom and obligation. This course shows how through the ages the Magisterium of the Church responds to social developments by interpreting Divine Revelation and teaching the demands of the Gospel with authority. The student will learn how Christ’s divine love for others, especially the poor and most vulnerable, is present today in the Church’s social doctrine and mission. and the social dimension of the Commandments. This book, The Social Doctrine of the Catholic Church, corresponds to Elective C: Living as a Disciple of Jesus Christ in Society in the curriculum framework. 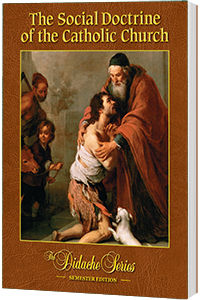 This textbook is published with ecclesiastical approval from the Archdiocese of Chicago, and it has been granted conformity with the Catechism of the Catholic Churchby the USCCB Subcommittee on the Catechism.